LONDON--(BUSINESS WIRE)--Technavio’s latest market research report on the global healthcare logistics market provides an analysis of the most important trends expected to impact the market outlook from 2017-2021. Technavio defines an emerging trend as a factor that has the potential to significantly impact the market and contribute to its growth or decline. Several cold chain service providers have recently started to offer end-to-end integrated services, such as road, air, rail, and ocean transportation and warehousing to end-users in the global healthcare logistics market. Disaster recovery services that enable customers to track consignments and help them communicate with the entire supply chain are also offered by vendors. In addition, some vendors provide training sessions addressing the overall supply chain process, such as managing inventories, storage, shipping, and information system for all the personnel involved in the cold chain logistics. “The increase in the provision of end-to-end integrated services by vendors is another trend that is expected to have an impact on the global healthcare logistics market during the forecast period,” says Shakti. Vendors in the global healthcare logistics market are changing their transportation mode from air to sea for the delivery of medicines/drugs because of certain advantages. One of the major benefits is a 70%-80% reduction in costs. In addition, it provides better temperature control, fewer procedures and clearances, and better visibility of the containers. Another shift is the usage of online services, such as e-health records, remote monitoring, e-prescribing, and mobile health applications. These new features ensure the delivery of medicines directly to patients. Logistics companies enable the delivery of medical devices and equipment to homes. The demand for these services is expected to rise rapidly during the forecast period because of the advantages they offer. The cold storage market in emerging economies, such as India and China, is still in its developmental phase. In addition, the population of India and China is very high. The market is witnessing a dynamic growth in developing countries, especially in the BRIC countries and Turkey. In addition, in 2015, India surpassed the US in terms of the total refrigerated capacity by 15 million cubic meters. In 2014, India reported 130 million cubic meters of refrigerated warehouse capacity, while the US reported 115 million cubic meters. This market growth is expected to be driven by the increase in the deployment of cold chain logistics in India and China. 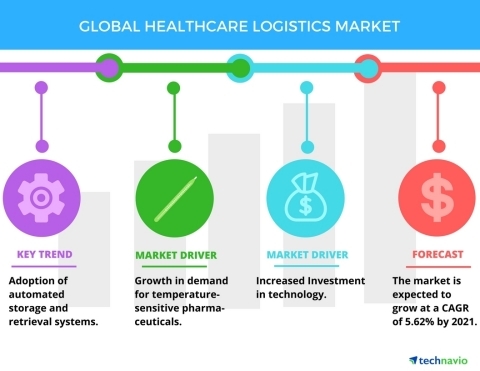 Therefore, the increased demand for cold chain logistics in emerging economies is one of the major trends that is expected to contribute to the growth of the global healthcare logistics market during the forecast period. Become a Technavio Insights member and access all three of these reports for a fraction of their original cost. As a Technavio Insights member, you will have immediate access to new reports as they’re published in addition to all 6,000+ existing reports covering segments like tags and labels, packaging, and warehouse and storage. This subscription nets you thousands in savings, while staying connected to Technavio’s constant transforming research library, helping you make informed business decisions more efficiently. Technavio’s latest market research report on the global healthcare logistics market provides an analysis of the most important trends expected to impact the market outlook from 2017-2021.